Everything is Connected With Everything Else: Myco Logic is an exhibition in the Heritage Courtyard Pavilion of the Parramatta Justice Precinct. This exhibition presents fungi-inspired artwork made in a new rehabilitation arts program at Cumberland Hospital. This exhibition presents an installation by Elizabeth Day bringing together artwork made in the first stage of a community arts program. Myco Logic is based on the image of fungi and their underground mycelial root structures, networks that transmit nutrients between species beneath forest floors. For Day, this non-centred image is a metaphor for community. The community arts program is based around creative exchange. In practical workshops, the program fosters connections between contributors and reconnects participants with their creativity through the process of making hand-crafted fungi together, skills sharing and storytelling. The pavilion exhibition is a public platform for the artwork made by participants. 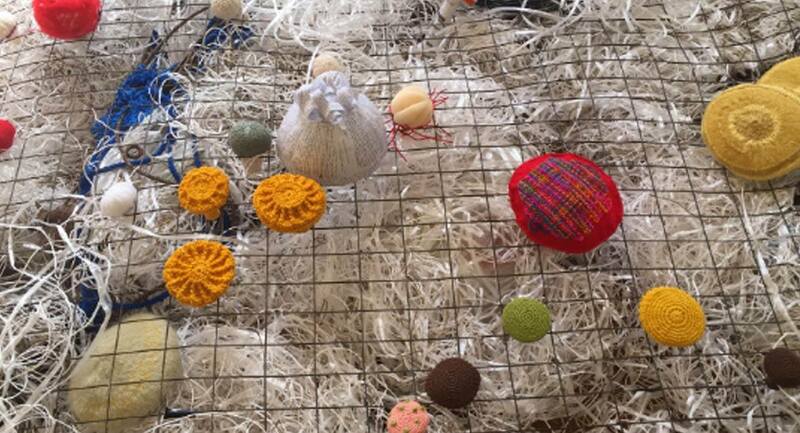 The mushrooms will be brought together on a network of roots in an installation by Elizabeth Day. This aggregated image explores ideas of connection and community. INVISIBLE WORDS/INVISIBLE WORLDS will be exhibited concurrently in the pavilion. This ongoing work by Elizabeth Day relates to institutional contexts that connect across this site and Parramatta North. After this exhibition, Myco Logic will continue to evolve as a participatory project until December 2017. This project has been assisted by the Australian Government through the Australia Council, its arts funding and advisory body. Myco Logic has been developed with consumer and carer advocates, and the Recovery Services team at Cumberland Hospital (WSLHD, NSW Health). The exhibition venue has been supported by Property NSW. The exhibition is presented as part of The Big Anxiety: festival of arts + science + people, NSW Mental Health Month and National Carers Week. Elizabeth Day is an established Sydney-based artist. Her work spans studio practice, interdisciplinary site-based practice and acting as a collaborator/facilitator on community arts and cultural development projects. Her work is concerned with historical issues and the present day marginalised such as mental health, prisoners and issues of Reconciliation. The ‘Prison on the Landscape’ thematic of her Doctorate runs through much of her work and different projects have focussed on migration and displacement, and institutions and contexts of incarceration and care. Her practice is informed by 25 years experience as an arts educator and facilitator in Corrections. Claire Taylor is an independent Sydney-based curator. She has a BA in Fine Art / Art History & Theory from Camberwell, and an MA in Fine Art from Central Saint Martins (both in London). Claire’s practice is collaborative and cross-disciplinary in approach. Formative initiatives mobilised diverse public domain sites through temporary interventions, event-based collaborations and projects that bridged research, education, publication and exhibition models. Recent initiatives have included site-based and socially engaged community arts projects. Claire is committed to facilitating art projects outside of gallery contexts to develop new modes of engagement for artists, participants and audiences.